On the air since 2007, "Mad Men" has had seven season to provide viewers with shocking plot twists and more than a few hilarious GIF moments. We've learned a lot about life, love, hard work, and the 1960s through these characters. And a lot about how much Don Draper can drink. This list of the best "Mad Men" GIFs compiles many classic moments from the AMC series that are sure to make you laugh. Since its premiere, "Mad Men" has received critical acclaim for its writing, acting, visual style, and come on, the costumes! "Mad Men" was the first basic-cable show to be nominated for Best Drama, at the Emmy Awards in 2008 and it's large cast of characters makes for some of the best television viewing so far this century. 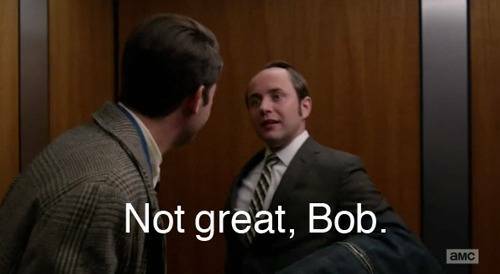 Check out and vote on this list of funny "Mad Men" GIFS featuring Joan, Peggy, Sally, Megan, Roger, Pete, and of course Don, the best of the best of the cast of "Mad Men" and some of their more popular moments.